This attractive Shaker style dining room huntboard server was fairly common from Virginia to the Carolinas in the eighteenth century. 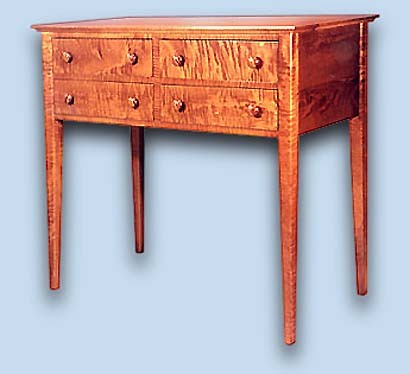 It features four dovetail drawers and is also available with six drawers. The dimensions are 44" long, 39" high, and 21 3/4" deep. The six drawer server table is 66" long, otherwise the same. The piece shown is made of lightly figured curly maple. These servers are available in all woods.